I got my family really addicted to this dessert, Ricotta Chocolate Pastry with Strawberry Compote last week. The smooth ricotta was going so well with the black chocolate as the filling inside, and the flaky puff pastry, crunchy almonds outside. The taste was sophisticated, combining the sweet and bitter filling with the slightly tangy strawberry compote served. 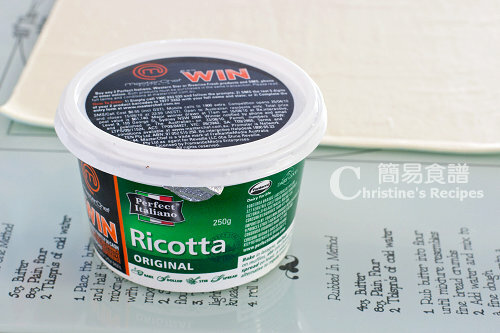 Ricotta is a kind of “young” cheese that contains only 13% fat. The dessert was light and served as a perfect ending of our dinner. Rinse the strawberries and drain well. Trim and slice. Place the strawberry, sugar and strawberry jam in a saucepan. Cook over low heat until the sugar completely dissolved and the strawberry softened. Don’t overcook them. Remove from heat. Let cool. Preheat oven to 180C (356F). 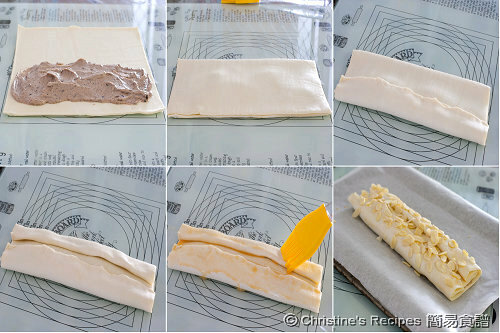 Prepare a baking tray lined with baking paper. Place the ricotta in a food processor and pulse for a few seconds until smooth. Add chocolate, icing sugar and vanilla extract, then process to combine. Set aside. Spoon the ricotta mixture out and evenly spread on half of the pastry, leaving 5 to 8cm on sides. 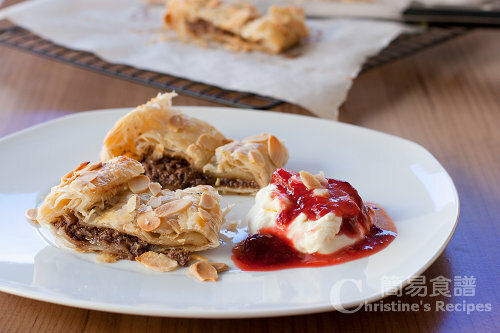 Fold in both sides to enclose the filling. Then fold both sides towards the center once again as picture shown. Brush exposed pastry with whisked egg. Sprinkle all over with the almonds. Bake for 20 to 25 minutes until the pastry is golden. Cool slightly, then cut into 4 pieces and dust with icing sugar if desired. Served with strawberry compote and fresh cream. The pastry that touches with ricotta would turn moist and soft. 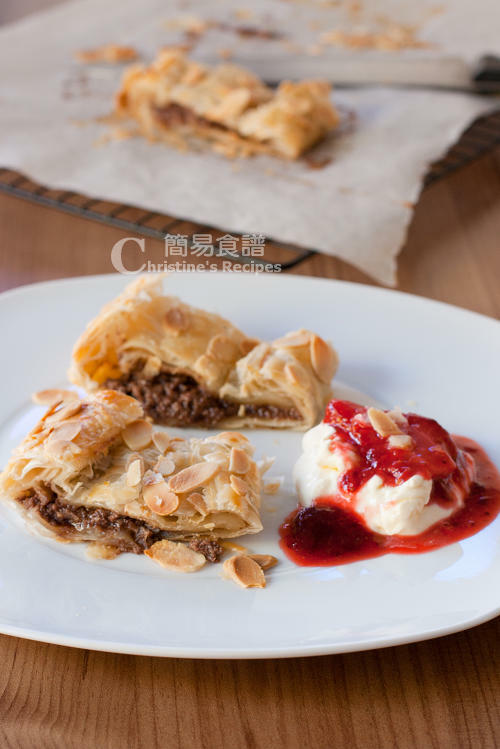 If you would like to have more flaky pastry, spread less filling and leave more room on all sides. 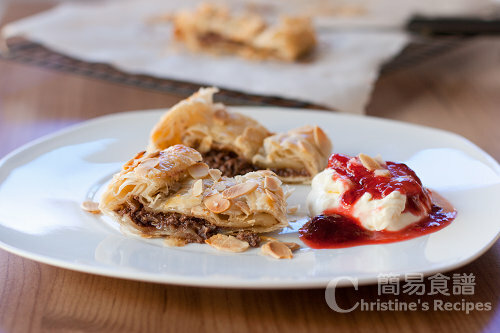 The portion of the pastry that doesn’t touch the filling would turn to be crisp and flaky after baking. That looks soo soo good. YUM! Wow.. that's a beautiful chocolate dessert! I think my family can finish a big tray :D I have a friend who is such a chocolate lover that I think he can finish one big tray alone! It's so tempting that I want to make it. I have a pack of flaky pastry in the freezer and now I must find time to do! My list is getting longer! Love this recipe because of its simplicity! hahaha i just made strawberry compote just yesterday :) this recipe is so simple, i'll try it out!